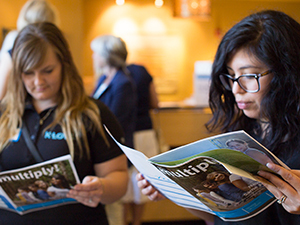 Guests read about Mercy in the 2016 Multiply! magazine. 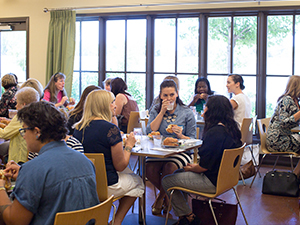 This month over 70 guests attended the Friends of Mercy Luncheons held at the Nashville and Sacramento Mercy homes. Guests at the Nashville home heard testimonies from current resident, Ally, and recent graduate, Katie. In Sacramento, guests heard from Bryce, another Mercy graduate. All three girls shared bravely about how God transformed their lives while they were in the Mercy program and about the hope they now have for the future. Ally, who is graduating in 13 days, shared that despite growing up in the church, she struggled with an eating disorder, self-harm, and feelings of worthlessness. At Mercy, Ally found true hope and love through Jesus Christ. Guests and residents connect in Sacramento! Katie described life before coming to Mercy as chaotic and dysfunctional. After her parents’ divorce, she used an eating disorder to mask the pain, but knew in her heart that God was the missing piece in her life. At Mercy, Katie learned to see her identity in Christ. She discovered that if God is the Creator, she is His creation and that if God is Love, she is loved. Katie graduated in December of 2015 and is currently learning to practically apply the biblically based principles she learned at Mercy. By 14, Bryce’s life was controlled by an eating disorder, suicidal thoughts, and pain from her mother’s death. She wanted nothing to do with God, but at Mercy, He gently drew her out of numbness into healing. Bryce is now a 2015 graduate who has been a Mercy Ambassador for the past year. She is moving to southern California to attend Bible College and is excited about spending that time learning more about the Lord. 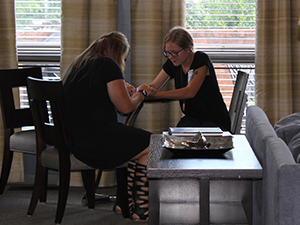 Resident Ally and graduate Katie spent time praying together before sharing their testimonies in Nashville. Mercy is thankful to Joe Flores, a Mercy Community Board member and principal of Flores & Associates Insurance Services, for sponsoring the Sacramento luncheon. For more information on how to get involved with Mercy Multiplied in your community, visit Mercy’s event page or call 615-831-6987.